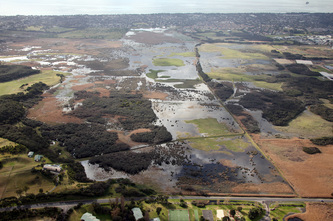 The Tootgarook Swamp acts as a natural water storage area and protects downstream properties along Chinamans Creek and Rosebud West from extensive flooding. With so many developmental proposals threatening to reduce the swamp's natural water regime, the potential for future flooding to properties is ever present as this groundwater moves downward and upwards. The downward flow occurs due to gravity and the upward flow occurs because fluids tend to flow towards areas of lower pressure (lower lying land). The groundwater maintains the saturation of the wetland system within the swamp. The shallow groundwater table sitting at the surface supports groundwater dependent terrestrial vegetation that uses the groundwater to maintain evapotranspiration potential. To explain, groundwater is not confined to only a few channels or depressions in the same way that surface water is concentrated in streams and lakes. Rather, it exists almost everywhere underground. It is found underground in the spaces between particles of rock and soil, or in crevices and cracks in rock. The level below which all the spaces are filled with water is called the water table. Above the water table lies the unsaturated zone. Here the spaces in the rock and soil contain both air and water. Water in this zone is called soil moisture. The entire region below the water table is called the saturated zone, and water in this saturated zone is called groundwater. Groundwater circulates as part of the hydrologic cycle. As precipitation and other surface water sources recharge the groundwater it drains steadily, and sometimes very slowly, towards its discharge point. That said, on the Nepean Peninsula, when precipitation falls on the land surface, rainfall seeps into the soil and percolates into the saturated zone. This process is called recharge. Places where recharge occurs are referred to as recharge areas. Eventually this water reappears above the ground, this is called discharge. 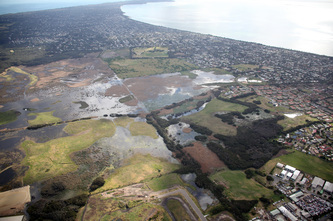 On the Nepean Peninsula this discharge appears in what we call the Tootgarook Swamp. Groundwater has a hydraulic gradient towards Chinamans Creek (figure 2). The creek was excavated to intersect the shallow watertable (0.36 m AGL [above ground level] – 0.32 m BGL [Observed depth to groundwater]) in an attempt to drain the swamp (figure 3), draining the site to Port Phillip Bay in-line with regional groundwater flow. 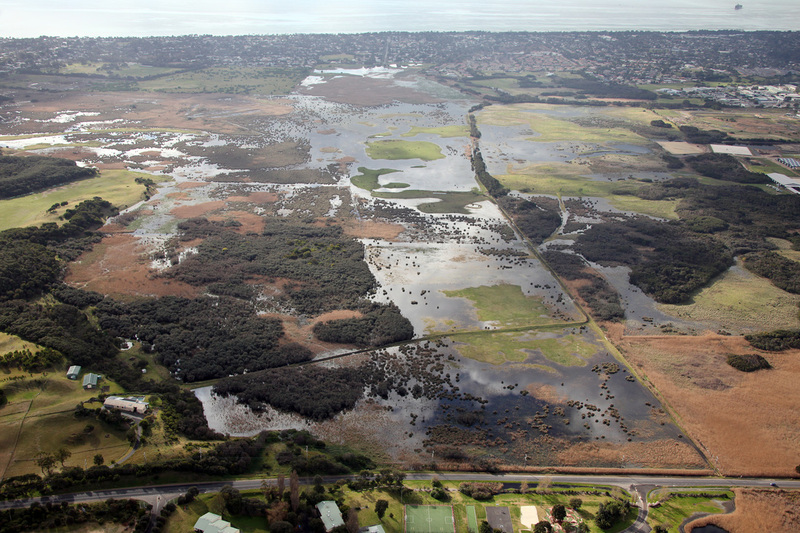 The swamp provides a protective buffer zone between the land and our shoreline, protecting the Port Philip Bay from siltation and nutrient runoff by acting as the kidneys of the aquatic ecosystem. Trapping the water like an immense sponge, it helps rehydrate the surrounding landscape and water table through the capture and control of underground flows, excess overland flows and direct input from rain. The swamp is naturally strategically placed within the catchment to intercept underground flows and floodwater, hence regulating stream flow and decreasing flood peaks. When water flows into wetlands, the flow slows, allowing suspended particles to settle. Biological processes remove, recycle and immobilise contaminants and nutrients. 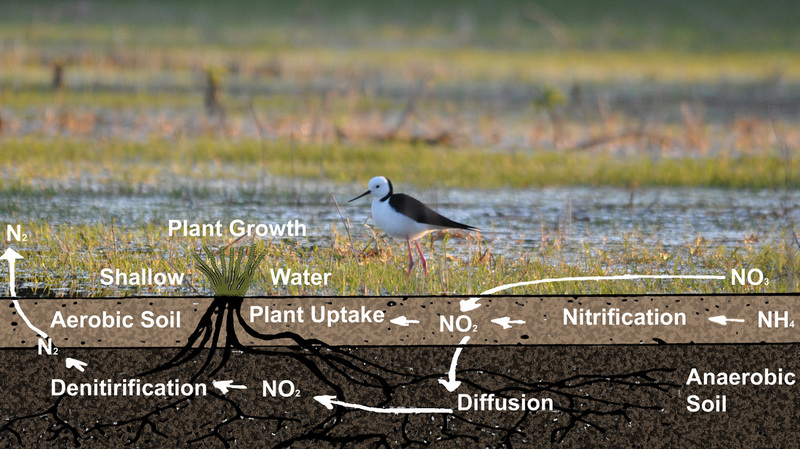 Wetland plants take up nitrogen (figure 2), phosphorus, sulphates, copper, iron and other heavy metals in the water. Wetlands can provide a suitable place for denitrification because anaerobic soil regions (where oxygen is not present) and aerobic soil zones (where oxygen is present) are found close together. Denitrification is the loss of nitrate (NO3) from the soil through the action of denitrifying bacteria. Wetland plants also absorb nutrients from the water for their own growth. Some of these nutrients are then removed by birds and other animals, which eat the plants, and 'disseminate' the nutrients outside of the wetland. Wetland plants add oxygen to the water, making it more suitable for aquatic species that live in it. Only a few depressions on the Nepean Peninsula hold water. They are the Tootgarook Swamp and some small swamps west of Sorrento. The clay or marl, as it was described by Chapman (1919) in the Tootgarook Swamp, which held the water is impervious. The peat there was formed in the shallow water, the level and composition of which influenced the decay of vegetable matter. The swamp occupies the channel of the old Tootgarook Tideway, the entrance to which Port Philip has been cut off by a small bay-bar. Peat forms when plant material, usually in wet areas, is inhibited from decaying fully by anaerobic conditions and these minerals are deposited in anaerobic bottom muds where they are contained. 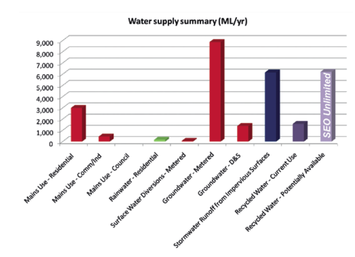 Figure 3 © Mornington Peninsula Shire Smart water plan 2013. Peatlands play a special role in conserving global biodiversity because they are the refugia of some of the most unusual species of wetland-dependant flora and fauna. Peatlands have been identified as a major storehouse of the world’s carbon exceeding that of forests. Peatlands that are actively accumulating organic matter are carbon sinks. Both aspects are worthy the attention of the UNFCCC. 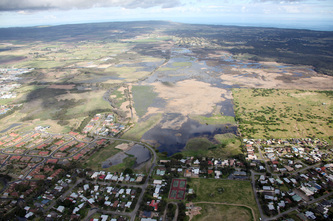 The groundwater maintains the saturation of the wetland system within the Tootgarook swamp, with the ground water table sitting shallowly at the surface. The swamp supports groundwater dependent terrestrial vegetation that then uses the ground water to maintain evapotranspiration potential. 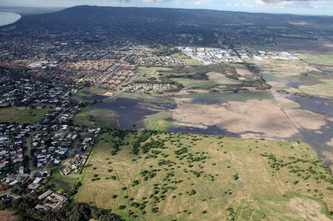 Essentially the swamp is an expression of the Nepean Peninsula groundwater. 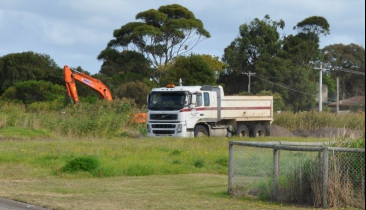 It’s actually a surface expression of the groundwater so what lives in the water at the surface, the flora and fauna, is all an expression of the wetland health and therefore the health and condition of the Nepean Peninsula ground water system. The swamp’s interaction with the groundwater through biological processes, removing, recycling and immobilising contaminants and nutrients, aids in the role of food production for local agriculture and stock watering. The swamp catchments mean average rainfall is 850mm, greatest in the months of May to August, lowest in the months of December to March, and the catchments overland flows are relatively low due to the high permeability of the surrounding sands and the formation of Selwyn fault. Runoff only appears in very wet years when the subsoils of the area are saturated. The catchment itself is very unique, essentially running along the ridge from Arthurs Seat, almost all the way down to Cape Schanck, and then all the way up to Point Nepean, and is to be considered significantly groundwater dependent (figure 3). 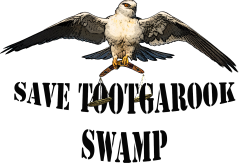 When the swamp is infilled, the water that made it wet has to go somewhere. If it isn't seeping back into the foundations of the house built on the former wetland, the water likely is leaking into formerly dry homes of downstream property owners and other parcels of land. Infilling (Figure 4) or draining the swamp not only destroys the sensitive wetland ecology but also leaves residents susceptible to the effects of climate change. During the wet season the water table is generally higher because recharge exceeds discharge. During dry seasons the water table is depressed because discharge exceeds recharge. Likewise, during periods of drought the water will be lower. Groundwater moves through the saturated zone both downward and upward. The downward flow occurs due to gravity and the upward flow occurs because fluids tend to flow towards areas of lower pressure. Hydrocompaction occurs when organic rich sediment like peat is subjected to loss of water. Since lowering of the water table involves loss of water, hydrocompaction often occurs. Most hydrocompaction is an elastic deformation process, that is to say it is reversible, so that when the peat dries out it compacts, but when it becomes wet once again, it expands. Infilling results in a reduction in water supply and water storage, the loss of flood plain land and flood plain protection of the swamp, and also decreases the capturing, control, and regulation of excess of water that recharges into the groundwater table. The infilling will increase backwater buildup upon the culverts in Chinaman’s creek. Therefore reducing the ability of infrastructure control flooding of contiguous areas and flood protection for Rosebud and urban land in the north. Infilling will increase drainage runoff into the swamp from new developments and gardens, even if the storm water is contained on-site. Water drainage will seep into the swamp and will increase nutrient levels and possibly cause eutrophication. Any new access roads will also create water runoff into the wetland area which will be polluted from vehicle movements including oil particles. Overall the water pollution discharge and leaching of nutrients into the swamp will seriously threaten the sensitive balance of this natural environment, even on a small scale. Page 58; Tootgarook Wetland Ramsar Nomination Feasibility Study, M. South, A. Costen, BMT WBM 2015. From the Greek word "αναερόβιος" (comprising from the words αν=without, αέρας=air and βίος=life) which literally means living without air.